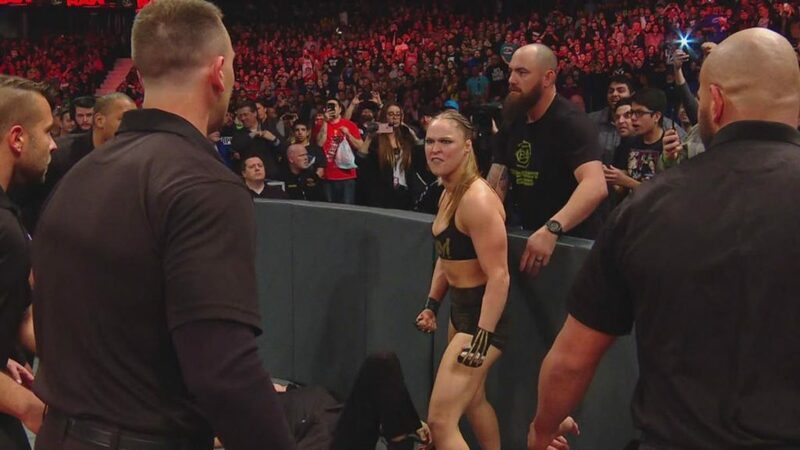 After last week’s “unprofessional actions” (taking out a referee during her beatdown of Dana Brooke) on Monday Night RAW, Ronda Rousey was fined an undisclosed amount by the WWE. But she’s still on the Road to WrestleMania, and this week, she showed up to RAW—late—with husband and one-half of the Browsey Acres power couple, Travis Browne, by her side. As she walked into the arena, Office Referee John Cone stopped the RAW Women’s Championship to remind her she was late (as if she cared) and inform her that WWE hired extra security to prevent “another incident” like last week (at this point, it was really clear she didn’t care). According to Dana, all she has to do in this match is just be better than Ronda for three seconds. Oh, Dana. One knee to the face, a couple more knees to the gut, an armbar, and it was over for Dana Brooke. But Ronda wouldn’t let go as Dana screamed for someone to make her stop. So eventually, another referee came out to put a stop to this… so Ronda pushed him, just like she did to a referee last week. Ronda then went to ringside to kiss Travis, beating up a security guard who put his hands on her, with Travis getting in on the beatdown too with an elbow to another guard who tried to subdue his wife. 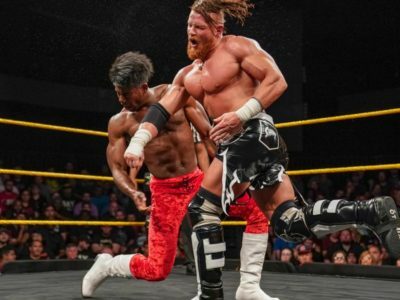 But while Ronda was more than ready to take on every security guard surrounding her, Travis pulled her over the barricade and took her to the back. As for Dana Brooke, it looks like her nightmare became a reality tonight.